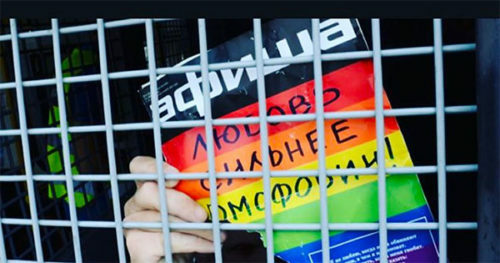 A group of about 60 LGBTQ activists assembled in St. Petersburg, Russia yesterday and roughly half of them were arrested. The incident occurred in Palace Square after the community’s request to hold a Pride parade was nixed. Reuters reported that police sought to detain anyone holding a rainbow flag or other “gay propaganda” in celebration. They were then forced onto a police van. It was widely believed that this summer’s World Cup might provide a false sense of security in a nation where homosexuality had been considered a crime until 1993. Being gay was considered a mental illness until 1999 in Russia. Then, in 2013, a gay propaganda law passed threatening anyone jail time for anyone engaging in “homosexual activity” with a minor. Anti-gay hate crimes have reportedly doubled since the law passed. Russian authorities continue to deny any wrongdoing toward LGBTQ people despite the current crisis in Chechnya that has the LGBTQ community actively fleeing from beatings and threats of exorcism. So sad, so sad… My heart goes out to all oppressed LGBT folks in Russia.